The year 2370 was a dangerous one for all concerned. The Dominion was discovered to be led by a race known as the Founders, who were capable of changing their own shape at will. This caused major disruption in all governments, as paranoia started to grow, paranoia that was fed by further disruptions that may or may not be caused by shapeshifters. When civilians overthrew the Cardassian government, the Klingon’s paranoia reached breaking point and they decided to invade Cardassian territory to apprehend the changelings that ‘obviously’ had allowed the civilians the ability to take control. The Cardassians sought assistance from the Federation, and the USS Defiant was dispatched under cloak to rescue the Cardassian government officials. This was successfully completed, and the Cardassians proved not to be Founders. However, the Klingons damaged the Defiant’s cloaking device, and thus were able top track it back to Deep Space Nine. Despite urgings from Captain Sisko, the Klingons decided to attempt to capture the station, figuring that the Alpha Quadrant would be much safer if they controlled the wormhole. Klingon forces are arranged as the player wishes as long as all vessels are stationary within 5 hexes of the left side of the map. Federation station Deep Space Nine is situated in the centre of the map, with the Defiant docked at the base. All forces already have their weapons fully armed as they have been waiting to start. The Defiant may not undock from the station unless the station’s shields fail. Until it undocks, it may not fire weapons or raise its own shields, it is protected by the station’s shields. The Klingons may target the Defiant, but damage is first scored against the appropriate shields. The Federation player must first decide at which docking port the Defiant is berthed. After 12 turns, Deep Space Nine detects Federation reinforcements, and will negotiate a truce with Gowron. However, this can only occur if the IKS Negh’Var has not been disabled or destroyed. Should this occur, the Klingon first wave will continue to attack until either they are all destroyed or the station has been captured. Due to the proximity of Federation reinforcements, and the unreliable intelligence about the station’s armaments, the Klingons decide not to push the attack and retreat. Federation: Federation forces win a major victory if they force the Klingons to withdraw, and a minor victory if they eliminate the entire first wave. 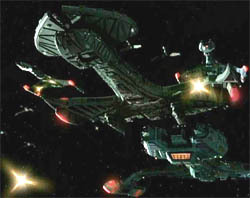 Klingon: Klingon forces win a major victory if the Station is captured intact, and a minor victory if it is destroyed. They consider it a draw if they withdraw. The USS Defiant was pursued all the way to Deep Space Nine, where Captain Sisko unsuccessfully tried to reason with Chancellor Gowron and General Martok. The Klingons attacked, managing to beam across several boarding parties, but these were successfully contained. After some severe fighting both in space and the Station’s corridors, Federation reinforcements led by the USS Venture were detected. Sisko managed to reopen communications with Gowron, and convince him to stand down. However, these events ushered in an uneasy period in Federation-Klingon relations.